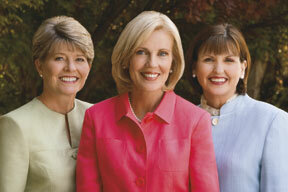 Elaine S. Dalton (center), president; Mary N. Cook (left), first counselor; and Ann M. Dibb (right), second counselor. We believe that one virtuous young woman, led by the Spirit, can change the world. As a Young Women general presidency, we have observed young women doing what they believe is right, standing as witnesses, living the gospel standards, and truly making a difference. It is amazing what one young woman can accomplish when she is virtuous, listens to the still, small voice of the Holy Ghost, and then acts! When Joseph Smith wrote the thirteenth article of faith, he expressed everything we can and must seek and become as believers. Joseph Smith knew that we must believe in standards and values and seek after these things in order to have the power and strength of the Holy Ghost. He knew we would need to follow the Savior in word and deed. He knew that doing this would prepare us to be worthy of the blessings of the temple. How will you do this? How will you lead others in following the Savior’s example, living a virtuous life, and preparing for the temple? First, believe in yourself! Your courage and strength have helped you become a leader, and your commitment will make all the difference this year. Your ideas, innovations, and actions can shape the world now and in the future. Because of the technological world in which you live, you have the ability to flood the earth with those things that are virtuous, lovely, and praiseworthy. You have at your fingertips the ability to testify of the gospel of Jesus Christ to the entire world. Never before has a generation had such an ability, blessing, and opportunity. Three Things Plus One﻿—Every Day! We believe in you. Now is the time to unite and begin a change that will empower you and bless others. We invite you to continue to do three things every single day﻿—plus one. Pray every morning and every night. Read in the Book of Mormon at least five minutes every day. In addition, we invite you to obey and live the standards in For the Strength of Youth. Become familiar with these standards. Share them with others. And be an example of the believers. This year, believe. Believe you are a daughter of Heavenly Father, who loves you and will help you. Believe in the Savior Jesus Christ. He is your light. He is your hope. He is your exemplar and Redeemer. Believe in yourself! Believe in the power of all young women living the standards. All together we can seek after those things that are virtuous, lovely, and praiseworthy. All together we can make a difference in our world. We believe you are the generation whose belief and actions will change the world. We believe in you!